New nvidia official driver for Linux stable 270.41.19 and beta 275.09 has come out for few days. 8 users responded in " Install New Official Nvidia driver release 270.41.19 in Ubuntu 11.04 from PPA "
screen brightness problem during the installation of ubuntu 11.04 on ACER laptop . if any solution plz suggest ,Fn +key not work. After installing this nvidia-current, I can not open Unity anymore, how do I uninstall it ? I don’t recommend trying to install this. I got the same problem as “Dileep” above – screwed up everything and finally I had to reinstall natty 11.04. It seems like it’s not safe to uninstall – I couldn’t get back to using my old system. I think something is wrong, although I would be happy if somebody proved me wrong so I can install the new nvidia driver myself. 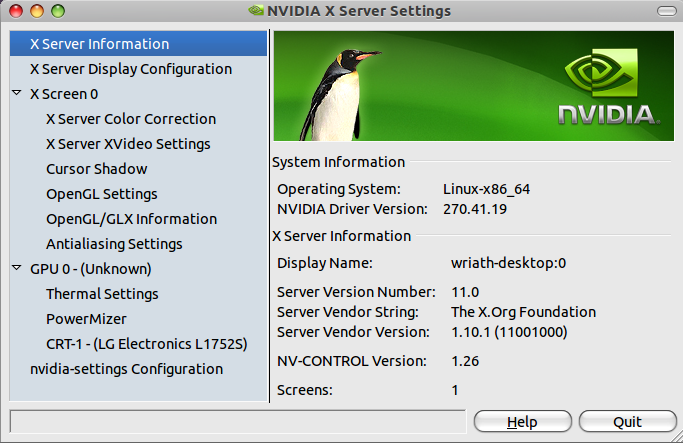 Today (10.9.2011) I replaced Ubuntu 11.04 provided nvidia-current package with the offered one. It works for my Nvidia GeForce 9800GT! The Ubuntu provided nvidia-current was crashing, I had use ‘recovery mode’ in this case.